Celebrate sewing and quilting with four 19th-century historical romances. Can Orion convince Tilly to let Bygones be bygones? Alice, The Bridal Shop owner, snubs matrimony---will a handsome groomsman change her mind? After Sarah's husband dies, his partner, Jack, makes Mending Sarah's Heart his priority. And Melissa and Lance are Binding Up Wounds between North and South. 448 pages, softcover from Barbour. Enjoy four historical romances that celebrate the arts of sewing and quilting. When four women put needle and thread to fabric, will their talents lead to love? Drawn to the new orphan boy in town, Tilly Rockford soon became the unfortunate victim of a lot of Orion Dunbars mischievous deeds in school. Can Tilly figure out how to truly forgive the one who made her childhood unbearable? Now she doesnt even know she holds his heart. Can this deviant orphan-train boy turned man make up for the misdeeds of his youth and win Tillys heart before another man steals her away? Alice Turner, the owner of one of Charlestons finest bridal shops, is determined never to be dependent on a man for anything after the disgrace of her fathers prison time. When her best friend requests Alice to be her maid of honor, she reluctantly sets aside her feelings on marriage and dons a stylish bridesmaids gown, never intending to catch the eye of the handsome groomsman. Will he be able to convince her to open her heart again and finish the quilt once intended for her father? Sarah doesnt need anyone, especially her dead husbands partner. With four brothers to mentor her boys and income as a seamstress, she seeks a quiet life. If only the Emporium of Fashion would stop stealing her customers and the local hoodlums would leave her sons alone. When she rejects her husbands share of the mine, his partner Jack seeks to serve her through other means. But will his efforts only push her further away? Melissa Bainbridge is a quirky designer of rag dolls who raises raccoons and never really fit into the small farming town. When Lance Witherspoon arrives in town to thank her for the Sanitary Commission quilt she made that saved his life, she is shocked to learn Lance is a Confederate. Can she and Lance confront the towns prejudices  along with their own? Mary Davis is a bestselling, award-winning author of over a dozen and a half novels in both historical and contemporary themes, eight novellas, two compilations, three short stories, and has been included in ten collections. She has two brand-new novels releasing in 2019. She is a member of American Christian Fiction Writers and is active in two critique groups. Mary lives in the Pacific Northwest with her husband of over thirty-four years and two cats. She has three adult children and two grandchildren. She enjoys board and card games, rain, and cats. She would enjoy gardening if she didnt have a black thumb. Her hobbies include quilting, porcelain doll making, sewing, crafting, crocheting, and knitting. Visit her online at http://marydavisbooks.com, or https://www.facebook.com/mary.davis.73932 and join her FB readers group, Mary Davis READERS Group at https://www.facebook.com/groups/132969074007619/?source=create_flow . Suzanne Norquist serves as the treasurer to her local ACFW chapter and co-leads the chapters critique group. She completed the Christian Writers Guilds Apprentice Class and has attended and helped organize numerous writers conferences. She holds a doctorate in economics and a bachelors degree in chemistry. As a result, she has worked at many jobs that sound interesting. Her work frequently involves technical writing, where the attorneys insist on two spaces after every period. Her husband and adult children make sure she doesnt take herself too seriously. In her free time (what little there is), she participates in kickboxing fitness and mountain climbing in Colorado. Liz Tolsma is a popular speaker and an editor and the owner of the Write Direction Editing. An almost-native Wisconsinite, she resides in a quiet corner of the state with her husband and is the mother of three. Her son proudly serves as a U.S. Marine. They adopted all of their children internationally, and one has special needs. When she gets a few spare minutes, she enjoys reading, relaxing on the front porch, walking, working in her large perennial garden, and camping with her family. 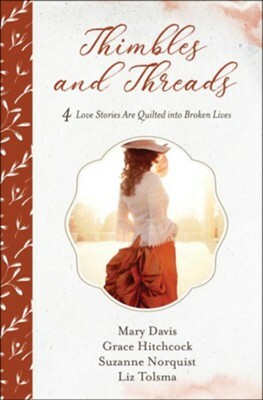 I'm the author/artist and I want to review Thimbles and Threads: 4 Love Stories Are Quilted into Broken Lives.